A tasty blend of help & support with all things vegan - including delicious recipes, amazing animal news, fabulous films, must-try products and compassionate campaigns. Spiced up with topical opinion features & sprinkled with some ‘grow your own’ tips. Weigh all of the ingredients direct into one large 2l jug or a bowl and whisk into a smooth batter. Pour or spoon the batter onto the hot pan/griddle – to the size you want (usually about 2-3 tbsp of batter mix per pancake). Cook until you see bubbles rise to the surface, the edges start to brown and the batter has set (about 2-3 minutes) they are then ready to flip. Use a spatula to carefully turn the pancakes over and cook for another 2 minutes or so. You can take a peak underneath to see if they are brown enough and cooked through. 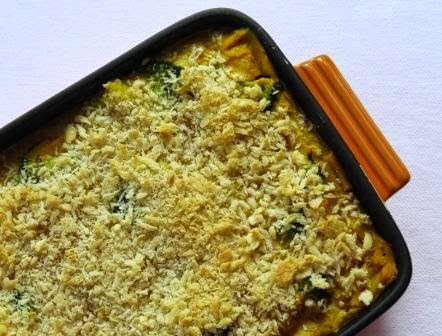 Best served immediately or you can keep warm in the oven, on low, while you cook some more. 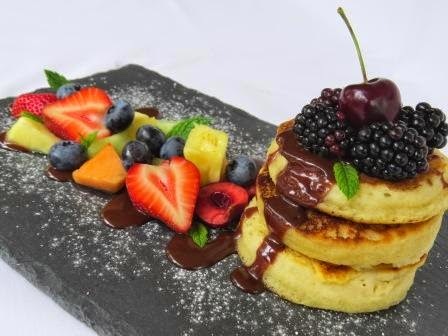 These were served with chocolate sauce and a ‘rainbow’ of fresh fruits! Or why not try fresh apple with caramel sauce, or bananas with nuts and maple syrup. Frying pans at the ready for pancake day! Want to be involved in a little bit of vegan foodie activism? As you’ll know it’s Shrove Tuesday coming up (17th) and it would be great if we can blitz the internet with as many vegan pancake recipes as possible! People and publications will be thinking about it from now, so it would be great if we can all start talking about it across our numerous social media platforms. If you have pancake recipes on your own blogs and are savvy to this type of thing then please start sharing and tagging! This coming weekend I’m also going to encourage people to veganise recipes that they find online and to post their own on various sites. If you’d like to do this too here are some sites just to get you started! You add comments below recipes or in some cases add your own recipes fully. Veganise the non-vegan ones! 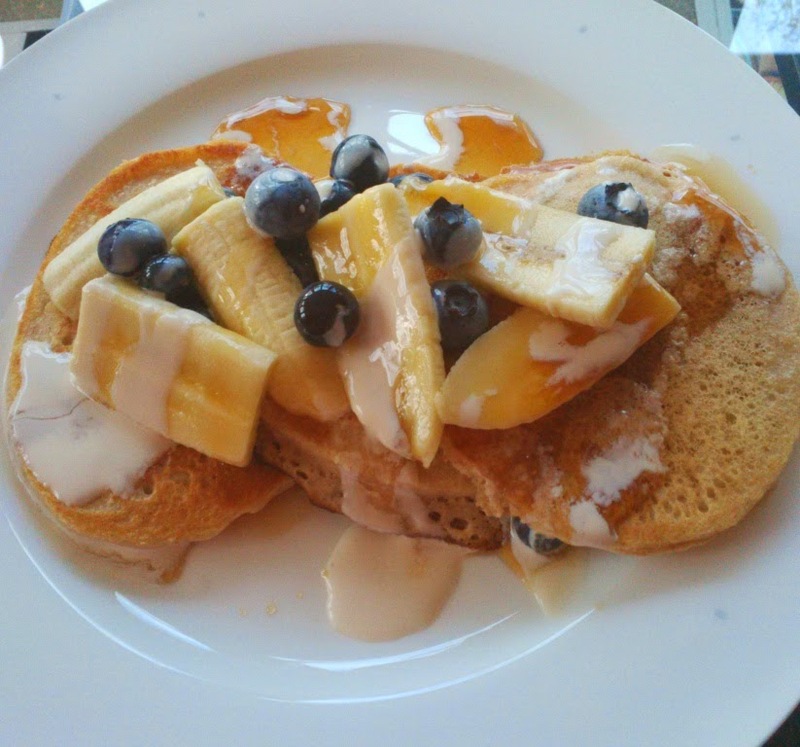 #pancakes #PancakeDay #shrovetuesday #dairyfree #eggfree #crueltyfree #vegan #easy2bvegan etc. You may or may not be aware that using more than 3 per tweet doesn’t work so well and is offputting to people. Also please remember to add in pictures of your delicious creations if you have them! Studies show that seeing photographs on a tweet/post significantly enhances its probability to be RT’d. Of course post on FB, IG and wherever else too! Although we’ll have missed print deadlines now, if you have the time, you might like to email any newspapers or magazines or other foodie websites with your pancake photos / recipes – perhaps ‘sell’ the idea more by mentioning all of the benefits we associate with eating vegan instead of non vegan. I’ll also make sure to add more pancake recipes to my new site (details to follow) which will be fully live by then. Next year, I’ll be far more organised for this and will try to get into mainstream media in advance. But for now we can at least hope to help some people see that eggs and dairy just aren’t necessary to make great pancakes! Please let me know if you have any more ideas that we can share with each other. Oh and please ask all of your vegan followers to get involved too! Those of you who've followed me for a while, here and on Twitter, will know that a few months ago I suffered with a bad allergic reaction to some chemical preservatives in paint that I then discovered were in several of my household products and toiletries as well :( It's called methylisothiazolinone and you can read more about it here. 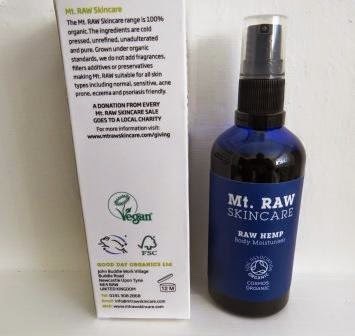 So I've banned anything containing it and I'm enjoying a range of more natural products now. 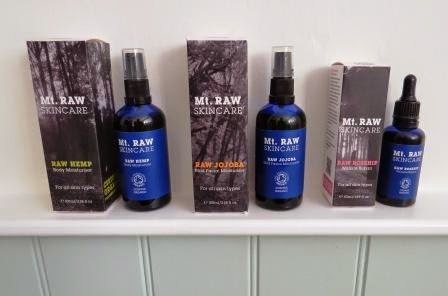 Mt Raw Skincare and I've been trying some of their products, so thought I would review! The products arrived safely, incredibly well packaged and I love the contemporary design of the boxes. And could there be a more beautifully simple ingredients list?! 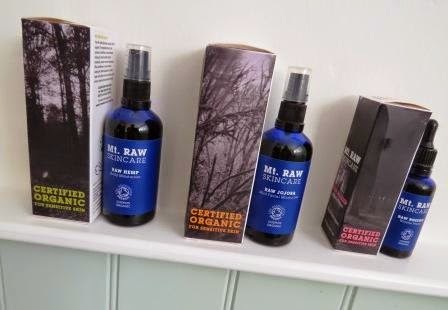 Just pure organic oils. Wonderful. Each has just a delicate fragrance of the natural core ingredient - but not so much as to be too pungent or offputting. 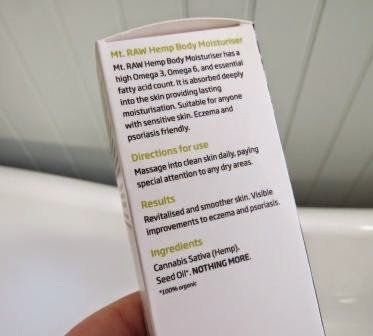 The moisturisers have a pump dispenser which works well and the wrinkle repair has a dropper that's ideal (you only need one drop near each eye!). They do feel very luxurious to use and although they might seem quite pricey, its clear they will last me a long time, so actually they're very good value. The dark blue glass protects the oils from daylight so the shelf life will be good as well. All in all I'm loving these products. 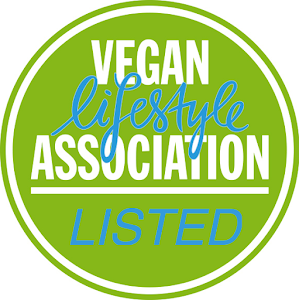 They're certified organic (which is even better to know when you're living a vegan lifestyle), registered with BUAV and for peace of mind they're also registered with the Vegan Society Trademark. You can find out more and buy your own here. I was sent these products as free samples to trial. My review remains, as always, impartial, genuine and unbiased. Talk the walk... why wouldn't you? In a former life I've appeared on TV and radio, been a trainer, a coach and a mentor and I've given talks and presentations to thousands of people. I love it. So now, I'm using that passion and experience to share with others, my thoughts on contemporary Veganism. And I say contemporary - because that's my only view and experience of it. I'm living it as it is (and can be) now. I was non-vegan less than 3 years ago, so I still have an understanding of that way of life. Perhaps this gives me a different kind of empathy and a fresh perspective? Come and see me speak and you can decide for yourself. Appearing at major Vegan festivals and on tour, UK-wide 2014/15. Available for any and all gatherings and events. This presentation comes from Chantal Denny – Founding Director of an exciting new UK Vegan project, who’s first public campaign 2014/15 “It’s easy to be Vegan!” launched with great success earlier this year. This campaign was developed in response to her survey on veganism that revealed people’s top (negative) perception of the lifestyle to be ‘it’s difficult and restrictive’. Her talk will prove that living a contemporary Vegan lifestyle is the complete opposite of this and that with a little know-how it’s far easier than people think. 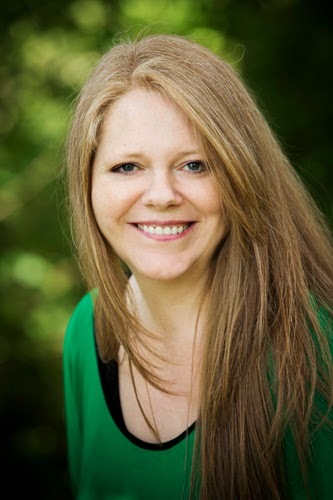 A persuasive and passionate speaker, Chantal offers a positive and thought-provoking approach to all aspects of living this way. She’ll chart the ‘rise and rise’ of veganism over the last few years and showcase a multitude of top tips for getting started or making existing lifestyles even better. This presentation will leave people inspired to live differently. They will also know that it’s entirely possible for them, even as just one individual, to save lives and help protect our beautiful home planet. Most importantly, it will give them the confidence and tools to do so, immediately. Chantal shows that the possibilities are endless and that the future really could (and should) be Vegan. Note: This presentation can be adapted to any length, from a short pre-dinner version (just 15 minutes) to an (entertaining!) full 60 minutes. Chantal is an experienced and enthusiastic public speaker. She favours an interactive presentation style, engaging audience participation and using multi-media visuals for best effect. Back-up resources for the presentation will be available online to help people after the event. Boil the kettle, weigh out your pasta and prep your veg. Boil the pasta in a large pan for 2 minutes then add the cauliflower and boil for another 2 minutes, then the broccoli and boil for 1 minute. Drain the pasta and vegetables and leave to one side. Add all of the sauce ingredients to a blender and blitz for at least 2 minutes and until perfectly smooth. Taste and season if required. Sprinkle the panko crumbs evenly over the top. Bake in the oven at 170C [fan] for approx 30 minutes or until golden brown on top. You can further brown under the grill if required. serves 6, or 4 if you're ravenous! Great served with a home-made coleslaw or some fresh tomatoes. Now you can pin me! 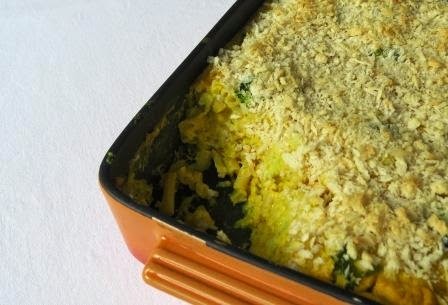 Super Vegan SUPPERS - ideas for Vegan-uary and beyond! Paws for thought: Destination Vegan? My journey to veganism. Let's do (Vegan) lunch darling...! BREAKFAST - wake up to vegan deliciousness! but here's what else you missed! Copyright Chantal DH '@ vegsoup4thesoul' 2013. Simple theme. Theme images by gaffera. Powered by Blogger.